Well... the glitter did not work lol. I have issues I know this! Here is the other VS polish I got called Velvetini, a dark purple with a slight grey or silvery shimmer. I open the bottle and the cap pull off, the plastic nub with the brush still screwed into the bottle. So I push the cap back on hoping it would go back on enough to let me twist it off with the brush. Ok phew, that worked. The bristle of this particular bottle was really fanned out, so awkward to paint with. After trying my second VS polish, I have to say I didn't really like it at all. I liked the color ok enough, but the price and everything else is not worth it. Oh I think I got the bottle size wrong in my other post, it's .25 oz and it's 7 bucks a pop! Or $6 if you buy two. I was pretty bummed how this purple treated me so I painted over it with Sinful Colors Hottie, that'll show you VS polish! I hadn't put on topcoat yet in the pics so pretty rough looking. Alex called this mani Starry Starry Night. I need to stop buying purples! Glitter makes everything look better. How do yo u make hearts?! The purple is pretty, but it doesn't sound like it's worth the price! Love the Sinful Hottie layered over it, though! To make hearts, just press on the alt key and holding it down, press on the number 3 over on the right numerical key pad. ☻ (that's alt 2). aha it worked! thanks Mary! 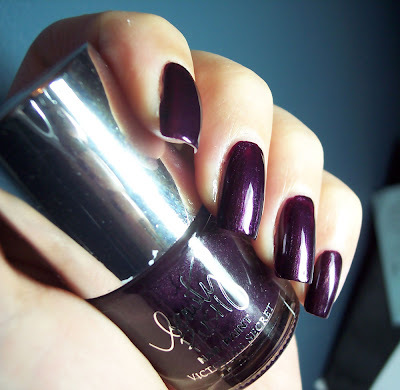 Love it with the Hottie on top, I think that totally made the mani! Gorgeous. Oooh hey, testing out the hearts - ♥. Neat! Thats too bad about the brush. And the price for dealing with dud bottle cap! It's a nice purple though. But I like it better, jazzed up with Hottie! Hot,Hot,Hot!!! Beautiful polish! It looks even better with glitter on it! Tuli: Yeah it's so lame when companies make products that really aren't that great but rely on their name to sell it. Thank you I love all SC glitters they are so pretty! Alexlyndra: Thank you, yes more glitter!